Practical Action is proud to be a member of the Zurich Flood Resilience Alliance, which is focussed on finding practical ways to help communities in developed and developing countries strengthen their resilience to flood risk. The Zurich Flood Resilience Alliance brings together private sector organisations, international non-governmental organisations and knowledge experts so each can bringing their own unique and valuable contribution. Over the five years, Practical Action will utilise the Flood Resilience Measurement for Communities in Bangladesh, Nepal and Peru to help find practical ways for people to thrive despite flood risk. This insight will support the rest of the Alliance and be shared globally through the Flood Resilience Portal, an online space designed to provide easy-access to information and guidance on flood resilience coming from the Alliance and beyond. 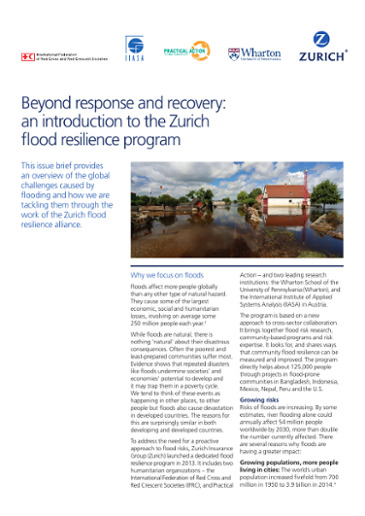 This issue brief provides an overview of the global challenges caused by flooding and how we are tackling them through the work of the Zurich flood resilience alliance. Nepal is among the 20 most disaster-prone countries in the world and faces almost every type of flood event, including flash floods, river floods, and glacial lake outburst floods (GLOFs). Climate change is exacerbating the impact of these flood events: changing weather patterns increase flood frequency, intensity and unpredictability, and increased glacial melt is worsening GLOF events. We will facilitate communities, local institutions and policy-makers to interpret climate change research and make responsive decisions. We will support them to build climate resilience into early warning systems and livelihood-based disaster risk reduction (DRR). Practical Action is leading innovation in lengthening lead times, to provide earlier warnings to at-risk communities. The programme seeks to combine research, community development and risk expertise to strengthen capacity and increase resilience of communities so that they can better assess, manage and recover from shocks. Experience from the programme will be used to shape and improve global tools for assessing flood resilience in communities around the world. We will also explore the use of weather forecasting for water basin modelling to create better early warning systems that incorporate rainfall-to-run-off dynamics. Practical Action will use its market system development expertise to research and test how the identification, assessment and protection of key supply and value chains can enhance flood risk reduction, preparedness and response. This area of work will build on Practical Action’s leading Emergency Market Mapping and Analysis (EMMA) and Participatory Market System Development (PMSD) approaches. Practical Action has a catalogue of in-action solutions. This provides rich source material for research into the costs and benefits of structural and non-structural measures to mitigation. Bangladesh sits at the cross-roads of three major rivers: the Padma (also known as the Ganges), the Jamuna (also known as the Brahmaputra) and the Meghna. In a normal year, over 20% of the country experiences flooding during the monsoon, and this can rise to around 60% in a major flood year. Despite the high occurence of flooding, those who live along the riverbanks have limited access to resilient livelihood options and lack support in the form of local level planning. The presence of the El Niño phenomenon creates unique flood-related challenges in Peru. El Niño events typically cost Peru around 12% of its GDP and thus are a major limitation on domestic growth. In light of this, the government of Peru introduced a new DRR law in 2011, outlining new responsibilities for local governments to deliver on risk reduction. This new law has mobilised the political will to invest in DRR activities, however, local governments still lack the capacity and skills to implement this law and make innovative progress. With particular regard to El Niño-related phenomena, and those most vulnerable to these phenomena. Many infrastructure initiatives to control river flow are currently planned that will have a huge impact on vulnerable river-side communities. Ensuring the have a say in these development processes is key to our work. We will ensure that EWS reflect the technical and communication needs of affected communities, and sufficient policy support to integrate them effectively. Every year during the rainy season, the price of food rises in urban areas due to reduced access to food and food storage losses. Practical Action will research this complex scenario and work with the municipal government to explore alternative access roads to mitigate price rises. This will require a revision of the infrastructure planning approach to make transportation more resilient to flooding.